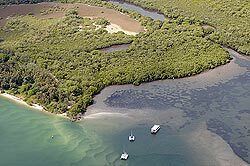 Saltmarshes are found in the upper coastal intertidal zone between land and salt water or brackish water in temperate and high latitudes where there isn’t strong wave action and sediments are able to build up. They are found on all continents other than Antarctica. They are dominated by dense stands of salt-tolerant (halophytic) plants such as herbs, grasses and low shrubs. These land plants are essential to the stability of the salt marsh because they trap and bind sediments. 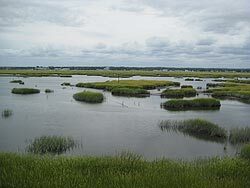 Saltmarshes play a large role in the aquatic food web and the exporting of nutrients to coastal waters. They also provide habitats for many terrestrial animals such as migrating birds as well as providing protection to the coastline. 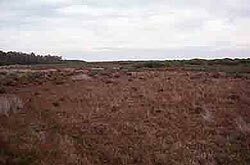 Unlike other land habitats saltmarshes are strongly influenced by the daily tidal flow that floods the area. This supplies sediments, nutrients and water to the marsh. Ever wonder about the grassy, marshy areas that form where rivers meet the sea? Salt Marshes are some of the worlds most productive, and vulnerable, ecosystems. Watch as biologist Susan Adamowicz, from the Rachel Carson National Wildlife Refuge, explains the history and importance of these areas to wildlife and people. Note: This is a saltmarsh from the USA so most of the species are different to Australia but the genreal principles are similar. I would sincerely like to thank the many members of the Flickr community who have given me permission to use their wonderful images for this unit. Their contributions really make this unit come alive! Also special thanks to Harry Breidahl (Nautilus Education) for his images of Victorian saltmarsh plants and his comments on the content.